Your Homeschool Planner - Design your own! My Homeschool Planner was created out of my desire to make my life easier. I wanted one book with space for me to write all my appointments, plans, menus, shopping lists, chore charts and schedules, as well as yearly and monthly calendars, with an address book included. I wanted a book which would be my Personal Diary and Homeschool Planner in one. And so, I created my own personal Homeschool Planner. This is now my Number One Organizational Tool! I always have my planner open on my desk and in that way I can see the big picture with an overview of the week's events. As I scan my double page for the week, I can see the meals I have planned, the guests and get-togethers for the week and the excursions we intend to do. I can also view all the school assignments I have set for each of my children for the week. I use my Homeschool Planner to record what my children are doing from academics to sports to parties, and it is also a way to help me plan from week to week. I love having my Planner in one handy book which I can take anywhere and enter in this way details on the spot. 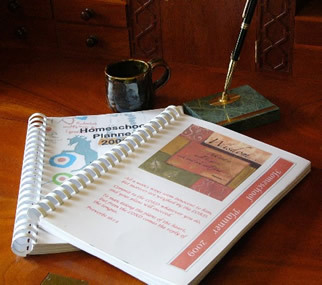 The Homeschool Planner is a unique planner which has been completely customized for my family to suit the needs of each of my eight family members. What about Your Complete Homeschool Planner? Over the past eight years, I have been creating planners for homeschooling families creating unique planners for their specific needs. However, I realized that instead of creating a planner for you, (which becomes a very expensive exercise), it would be much better to describe the process of building your own. Then use my DIY Homeschool Planner Templates and build your own planner to suit your family members. The planner is organized around a 5 week month. Since months have between 4 and 5 weeks, this is how I have arranged the weeks. Week 5 refers to the last few days of the month until the 1st. Weeks 1 and 5 will not be full weeks (mostly). Your Menus, Shopping Lists and Cleaning Schedule is based on this 5 week system. Once you go through those pages, you will understand the system better. The ingredients you need to make the meals that you plan to have in Week 1 will be listed in the Grocery List you make for Week 1. Ingredients for Week 2’s meals will be listed in Grocery List for Week 2, and so on. Your cleaning schedule is also organized around the 5 week system. Each week you will focus on a Cleaning Zone. You need to divide your house into five zones, enabling you to focus on a different zone each week, spending around 15 minutes a day cleaning it. For example if Zone 1 is the kitchen and hallway, you will spend 15 minutes in that zone each day. You cannot clean absolutely everything in that week, but don’t be dismayed, because you will revisit this area every month – every Week 1. (Actually, since Week 1 will not be a full week, it is best not to choose an area with a lot of cleaning potential, such as the kitchen or bathrooms). This is mentioned again (in the DIY ebook) as you work through the pages on cleaning. It will all make sense and once you’ve made this system work for you, your household will run much more smoothly. This is the bulk of my own planner. Each month begins with a calendar, with daily squares to fill in. Following that is a weekly planner, set over a double page and written in landscape format. It is where you will write in any appointments, visitors, meals, to-do lists, groceries, and so on. You can also do this in a portrait style which is also available. Following the weekly planner is a double page for your Homeschool Week. This is where you can plan your daily or weekly assignments for each child. If you are homeschooling one to two children, you can have a weekly overview from Monday to Friday across the top and the Subject areas listed down the side. In this table format you will be able to add the details of your Homeschooling Week, day by day. If you are homeschooling more than two children, it would make more sense to have a table in which you have your children’s names across the top and the Subjects down the side. Then you will need to write weekly assignments in the boxes rather than daily assignments. Do you use textbooks and work according to a strict schedule? Fine... let's list your subject areas and leave room for page numbers, comments, and checkboxes. Do you like to pre-plan some of your week and write in specific assignments per subject area and leave the rest to evolve? Fine...let's make sure we leave some bigger spaces for comments. Does your family learn using a more natural learning approach where you prefer to enter details after the week - recording what learning activities you were involved in? Fine ... use the template with larger spaces. Are you looking for a Charlotte Mason Planner? Or do you work according to the Ambleside Curriculum? Leave room for Nature Study, Poetry, Readings in various subject areas, Copywork and Dictation. 52 double paged weeks to use for events/menus/ appointments. 52 double paged weeks for you to add details of your childrens assignments for the school year. There is space for each child and each subject area. Doodle Planner pages are also possible if you like to work in an open format - brainstorming, Unit Studies and so on. Do you have an idea in mind? A Year at a Glance-calendar of the current year and the following year. Then customize your own planner with your own front cover or photo; Bind it or place it in a 3 ring file/folder. 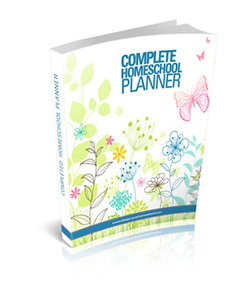 Find out more about the Do-it-Yourself Home School Planner. Option 1: Your Complete Homeschool Planner - DIY! Option 2: Keep on Track - Simply Stylish Planner!